August | 2013 | Creative Musings..
1.Golmaal (1979): If you haven’t watched Hrishikesh Mukherjee film,then you are missing something. His film created in simplest way possible had a charm which no film-maker can boast of. 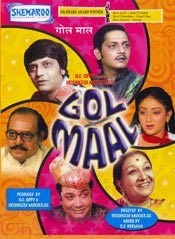 Golmaal is a absolute gem. One of those few films which you can watch again and again. The chemistry between Amol Palekar and Utpal Dutt(at his eesshing best),the protagonists is mind-blowing. These two characters are the pillars of this film well supported by other actors.Amol Palekar switches between the two characters Ram Prasad and Laxman Prasad with ease even though the two are opposite extremes. Utpal Dutt’s character as Bhawani Shankar is mark of a brilliant characterization very well executed by great performance. Bhawani Shankar is a man of traditional values,hates youth who concentrates on “other” things like sport,music at a working age and one weird trait -he believes a man without moustache is characterless meaning Mooch nahin to saala character dheela hai. Dina Pathak sizzles with her brilliant portrayal as Amol Palekar’s mother. Some of the dialogues are epic like Ram Prasad when he utters that Kurta to sharir ke uparardh ki lajja nivaran ke liye hota hai to defend his short kurta for the interview or when he says Manushya ko apne adarsh aur moochon ka uchit aadar karna chaiye. Moustache is the mirror of human soul and mind.Mooch to mann ka darpan hai.The Aane wala Pal rendition with Kishore Kumar on vocals strikes the chord perfectly. All in all an out and out entertainer sachhi-moochi. 2. 3 Idiots : This film from one of my current favorite director Rajkumar Hirani is a classic,both commercially and critically acclaimed at the same time. Here script is the winner and there’s never a moment in the film where you feel bored or story is inconsistent. This film has several moments which makes you laugh your lungs out whether it’s ragging scene or the Chatur aka Omi Vaidya’s address to the college crowd where he tries to impress the principal with his Hindi speech, Rancho’s(played by Aamir) explanation of a machine or the opening scene where Farhan aka Madhavan’s escapes from the boarded flight. Aamir along with all the characters played by Madhavan, Sharman, Boman, Chatur and others have done a commendable job. The charm of the movie is that it conveys a message without being boring or too preachy. It talks about dysfunctional education system and rise in student’s suicides and addresses the need to aim for excellence by which success will definitely follow.Aal izz well with this movie. 3. 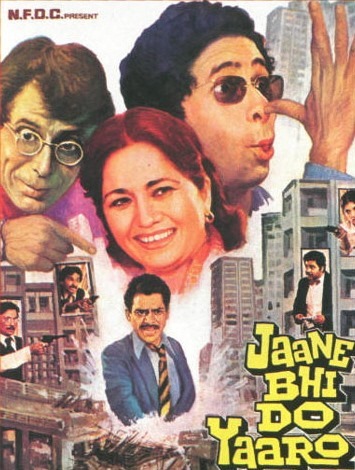 Jaane Bhi Do Yaaron: It is a satirical take by Kundan Shah on rampant corruption in the society with an impressive ensemble cast comprising of Naseeruddin Shah, Pankaj Kapur, Satish Kaushik, Om Puri, Ravi Baswani,Satish Shah and others. For anyone who loves satire, this is a must watch. Even though it didn’t do well when it was released this has become a cult classic because of it’s relevance. 4. 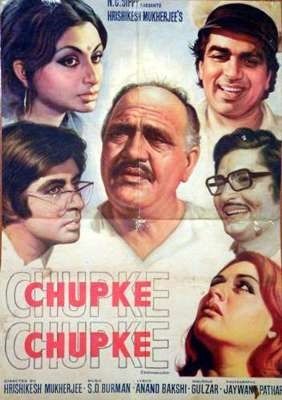 Chupke Chupke: Another classic from Hrishikesh Mukherjee sans Utpal Dutt. This one also features Dharmendra-Amitabh combo released in same year i.e. 1975 as that of more popular Sholay. Dharmendra(as Parimal Tripathi),a botany professor disguises himself as a watchman(to save watchman’s job who has to go to his village on an emergency) to serve a group of college students who are on a excursion. He does really well until Sulekha Chaturvedi played by Sharmila Tagore comes to know of the cover up act and recognizes Parimal. She is charmed by his personality and they both get married. Sulekha is in awe of her jijaji(played by Om Prakash) and respects him for his intellect and never fails to praise him in front of Parimal. Parimal is fed of all this praise hearing it repeatedly. Upon an opportunity, he being a prankster,decides to disguise himself as her jijaji’s cab driver who is in need of hindi speaking driver. Om Prakash has never seen Parimal in person as he could not attend his marriage and that allows Parimal a perfect opportunity to fool her jijaji by pretending to be a driver and prove he is as good as her jijaji. So here’s goes the plan- Parimal disguises himself to be Pyare Mohan Illahabadi who knows only Hindi as per the requirement. Sulekha will go to her jijaji’s place after some days alone and pretend Parimal is out for work and will join soon. Dharmendra does really well as Pyare Mohan. He impresses with his driving skills, speaks chaste Hindi and vows to learn English from her jijaji by confusing him by asking Qs like ”Agar ‘do’ du hai, ‘to’ tu hai, toh ‘go’ gu kyun nahin?? Soon Sulekha joins him and they both play prank after prank on the unsuspecting jijaji. First Sulekha pretends she is not happy with her marriage,then she puts an impression that she is having an affair with Pyaare Mohan and if that is not enough they both bring in Sukumar Sinha played by Amitabh Bachchan, a English professor and Dharmendra’s close friend to play himself as Parimal. Parimal’s another friend P.K.Shrivatsava played by Asrani also joins the act. His sister-in-law Vasudha played by Jaya Bachchan suspects Sukumar’s(disguise of Parimal) infidelity to his wife Sulekha when he tries to get close to her. Sukumar falls in love with Vasudha revealing his true identity much to her disbelief and tells her all the drama they were carrying out. In the end Dharmendra reveals himself as Parimal Tripathi and when Jijaji comes to comprehend of the whole act he admits he was totally fooled. This comedy of errors,an act of mistaken identity provides you with a hearty laugh throughout the film..
5. Hera Pheri: This is Priyadarshan(The Director) at his very best and Paresh Rawal at his career best. The trio of Akshay Kumar(Raju), Sunil Shetty(Shyam) and Paresh Rawal gives us some uncontrollable laughter throughout the film. Nothing betters the comic timing of the trio especially that of Paresh Rawal who plays character of Babaurao Ganpat Rao Apte with an superlative performance. 6. 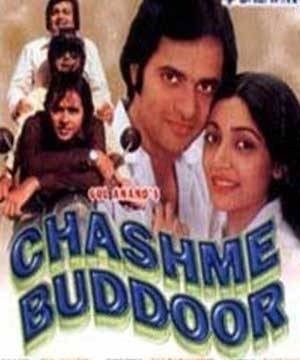 Chashme Buddoor(1981): This is a romcom pairing Farooq Shaikh and Deepti Naval. This movie is very much likable especially the characters of 3 roommates played by Rakesh Bedi,Ravi Baswani and Farooq Shaikh who plays a studious boy. During their vacation Ravi & Rakesh see a girl (Deepti Naval) in their locality and try to impress her in their own way and fail miserably. However one fine day Deepti visits their room by chance as a salesgirl selling a detergent powder. Both Ravi & Rakesh escape while Farooq confronts Deepti after some hesitation saying he isn’t interested to buy any detergent. Deepti gives her demonstration of detergent “Chamko”- kapdo ke liye behtareen sabun, baar baar lagataar, Chamko kapdo mein chakachaundh chamak lane ke liye, khushbudaar, jhaagwala Chamko”. This scene forms the highlight of this film blending the innocence of the age and charmness that characterizes this romantic comedy. From here, a love sto ry begins and ends with a spate of kidnapping and hero’s rescue act in the climax. In one word, a charming movie. 7. Lage Raho Munna Bhai: A sequel to another epic film Munnabhai MBBS, this film has managed to capture everyone’s imagination making Gandhigiri popular. Raju Hirani impresses once again. A strong message is delivered without compromising on entertainment(you can find loads and loads of it) and the flow of the story. Aur kya chahiye film mein?? The Munna-Circuit pair sizzles yet again well supported by great performances from Boman Irani, Vidya Balan and other support cast. Apart from the commercial success and critical acclaim this film had a larger impact on society than any other film I can think of. This film revived an interest in Gandhism under the new term Gandhigiri with people using non violent ways to stage protests, handing out roses to people breaking traffic rules,sending get well soon cards, creating websites and putting on Gandhi topi. This film achieved the distinction of first Hindi film to be shown in UN.“Bande mein tha dum Vande Mataram” rendition by Sonu Nigam and Shreya Ghoshal is soothing. Final thoughts: A landmark film!! 8. Dil Chahtha Hai: A coming of age romantic comedy, nothing is mediocre in this film. Great script, brilliant performances, top notch direction by Farhan Akhtar(never looked like a debut) and awesome music catapulting Shankar Ehsaan Loy to a whole new level altogether. Aamir’s character of Akaash in a completely different avatar to that of Bhuvan(his character in Lagaan which was released barely months before DCH) is highly commendable, a genius @ work. Sameer played by Saif is lovable and equally good. Akshaye Khanna, an artist, sizzles with his brilliant portrayal of Sid with special mention of his facial expressions which I really liked. One of those films which lightens you up when you’re down. 9. Andaaz Apna Apna: This Amar-Prem Katha featuring Aamir-Salman duo has become a cult classic after being a box office disaster during it’s release. This film is gre atly driven by epic dialogues,brilliant comic timing and superb characters like Mugambo ka Bhatija,Gogo mai baap Jo ankhen nikal ke gotiyaan khelta hai,Humara Bajaj,Dusron ka Game baja daalne wala Teja ,Very Smart Bhalla and his deputy Rabert, apart from Aila!! Amar,Ooi Maa!! Prem, Raveena who plays Karishma and Karishma who plays Raveena. “Yeh Raat Aur Yeh Doori” by SPB & Asha Bhosle is my favorite track from the album. 10. Zindagi Na Milegi Dobara: This is a story of three friends who set off to Spain for a bachelor trip where each friend chooses a sport of his choice for the trio to attempt overcoming their fears. 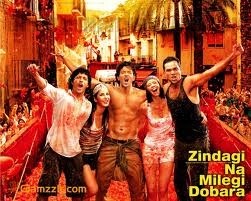 All the actors have done justice to their part fully with great direction from Zoya Akhtar. 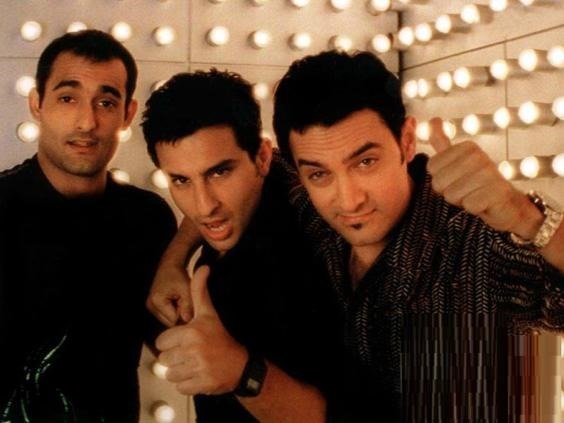 A complete entertainer whether it’s Abhay Deol’s trick to reveal friend’s unknown secrets, Javed Akhtar’s poetry, Farhan’s dialogues, Hrithik’s dance moves,Katrina’s charm,SEL music- “Der Lagi Lekin” being my favorite. A feel good movie with a message to live life fully by seizing the moment. A paisa vasool film! !